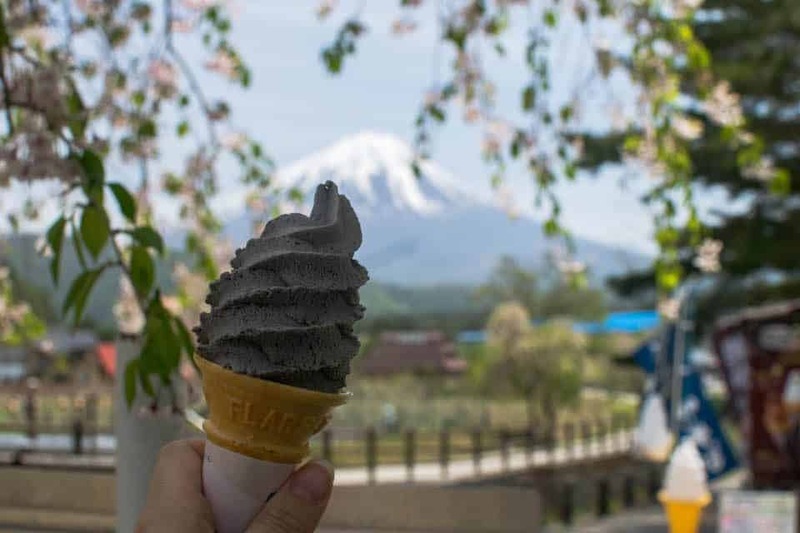 Try these 28 Japanese foods while you are in Japan! Are you looking for delicious things to eat in Japan? 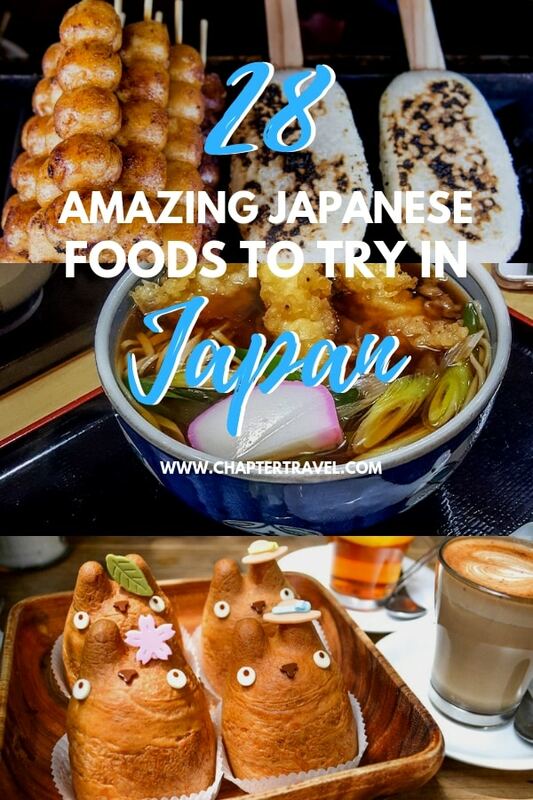 You’ve came to the right place, because this foodie guide for Japan is filled with amazing Japanese foods that you must try during your trip to Japan. For this ultimate foodie guide I asked other travel bloggers what kind of food they would definitely recommend someone to try when visiting this amazing country. So, what are the food you must eat in Japan according to them? Well, I’ve received a lot of different recommendations and listed them all in this article… Get ready to get hungry! I personally love, love, love Japanese food! 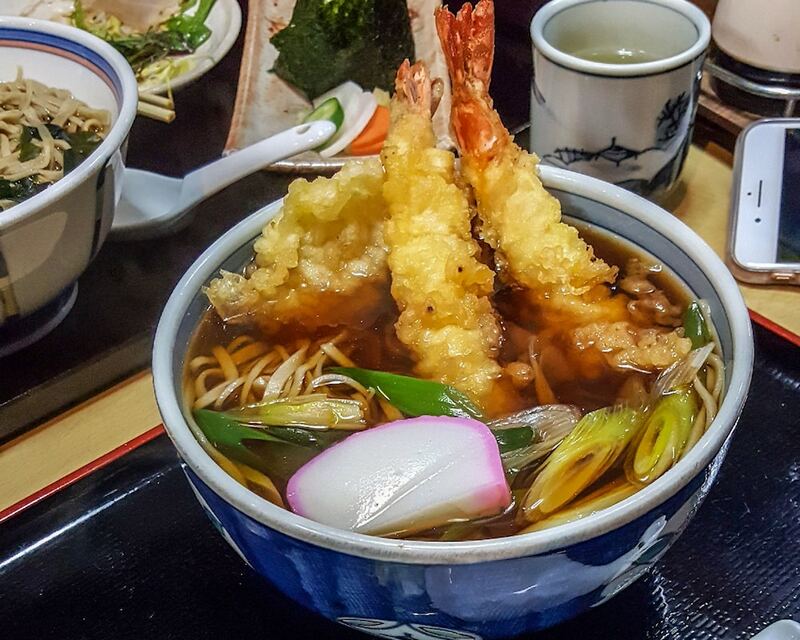 Sushi, ramen, tempura, udon… It’s all so good! But the Japanese cuisine offers so much more than the well-known sushi and ramen. Luckily this foodie guide includes all sorts of amazing dishes to try. Below you can find over 20 recommendations from travel bloggers from all around the world. Enjoy your meal! 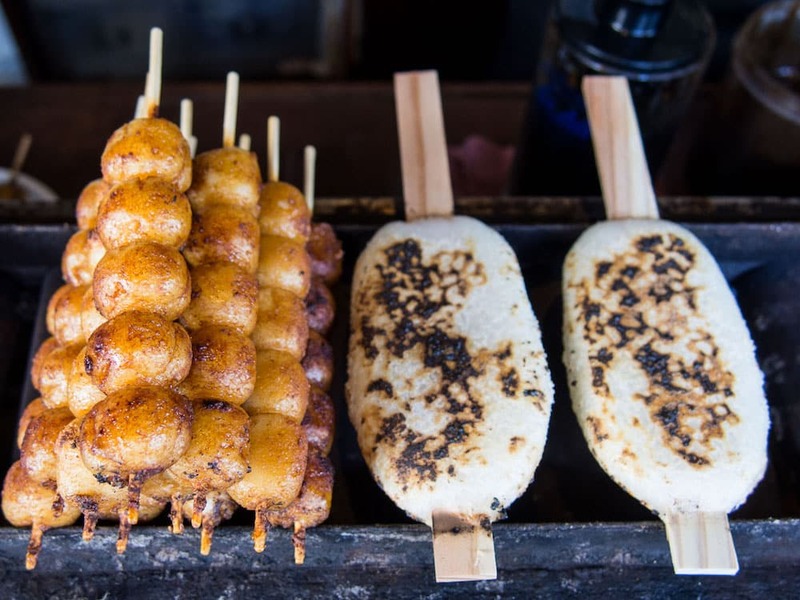 Kushikatsu, also known as kushiage, is a dish of meat, seafood, or vegetables that have been skewered, covered in a breadcrumb batter, and deep fried. The dish sounds deceptively simple, but the skill, care, and attention of the kushikatsu chef ensures that each individual piece has a light and crispy exterior, with an interior that is cooked to perfection. We first ate this dish in a small kushikatsu restaurant in Osaka, the city where the dish originated. There were only 7 seats, so for the restaurant to be successful, the quality of the ingredients, and the cooking, needed to be exacting. And it was. We found that the best way to introduce ourselves to the dish was to order a mixed plate, as it provides the full range of textures and tastes. Our mixed plate included sausage, baby corn, quail egg, pork, okra, lotus root, eggplant, and pumpkin. All equally delicious. The standard kushikatsu dish is served with a dipping sauce and a plate of cabbage. Written by Markus Kampl of The Roaming Fork. Have you had unagi no kabayaki (grilled eel)? 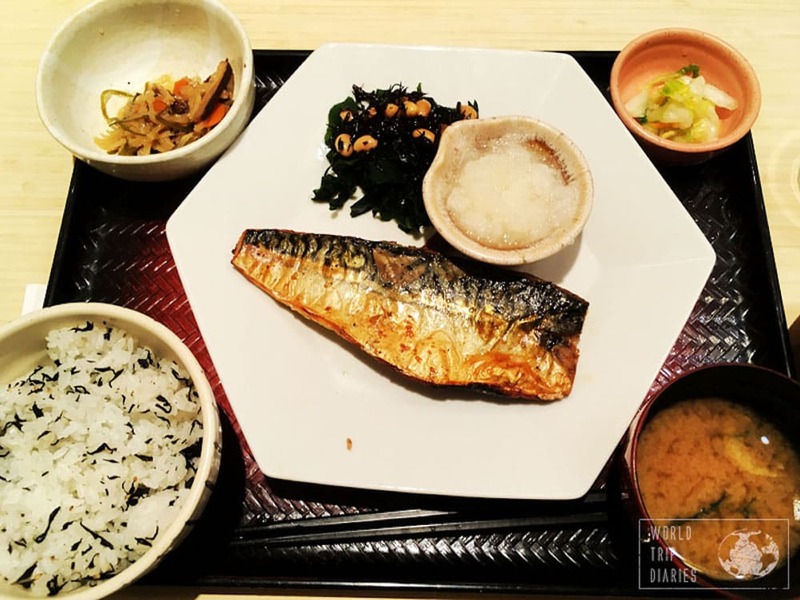 If you love unagi, then this is the dish that you have to try when visiting Japan. Each region of Japan makes their unagi no kabayaki differently, so eat them all to see which version you like the best! This dish is prepared with the eel getting cleaned and filleted. It’s marinated in the shop’s special unagi sauce (soy sauce, mirin, and sugar) before placed on the charcoal grill. The grilling brings out the intense and rich flavors from the eel and the sauce. If you’re eating at a restaurant, you usually receive half a piece of unagi, along with steamed rice, pickles, and miso soup. You can also find unagi as a street stall item and on a skewer. 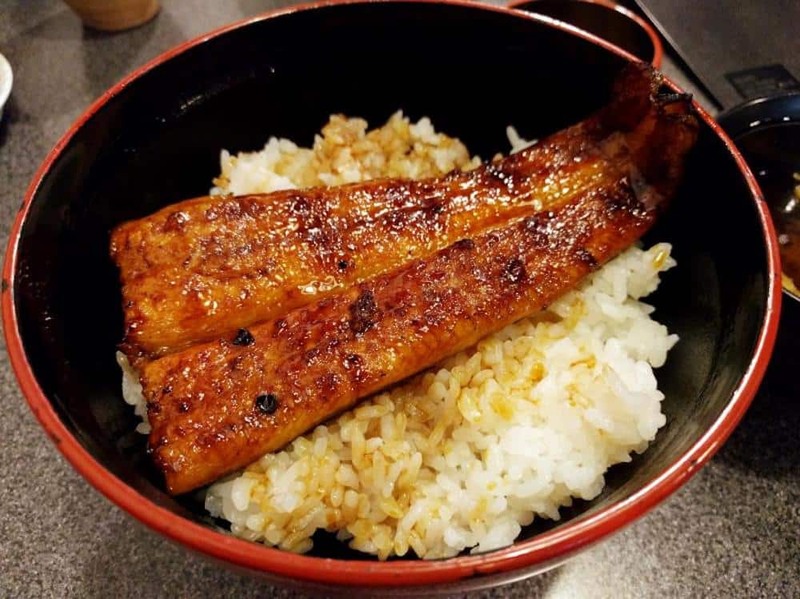 Unagi can be pricey at over $20 USD per serving but it’s well worth the cost for the deliciousness in a bowl. Written by Jackie Szeto & Justin Huynh of Life of Doing. Japanese curry is a super popular dish in Japan. Curry itself was introduced to Japan during the 19th century by the British who were in control of India at the time. Japanese curry though has been adapted to Japanese tastes – it is more sweet than spicy. 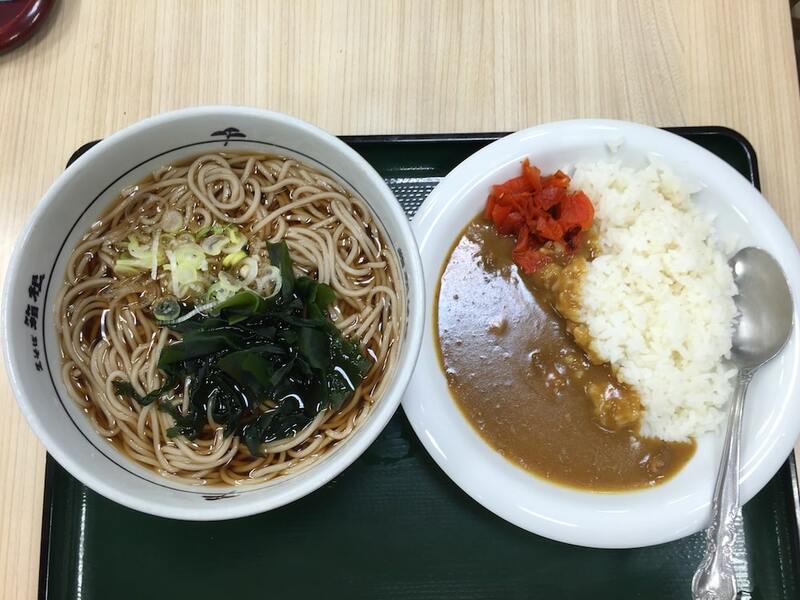 Japanese curry is usually served over rice but can be served over noodles. It’s usually got some sort of meat (usually fried and breadcrumbed chicken or pork cutlets) as well as carrots and potatoes to make a stew-like dish. Having been served in Japanese schools, camping trips and the like since childhood, Japanese curry is considered to be a comfort food by many Japanese! Written by Shobha George of Just Go Places. If you’re traveling in the Nagano Prefecture you will find lots of oyaki around, otherwise known as hot-spring-water steamed buns. These delightful snacks are sold by street venders who pull them out of steaming boxes. You can tell which ones are the best by looking for the person who has the longest line of people queuing in front of them. The oyaki are often filled with different kinds of meat or vegetables so there’s good reason to try them a few times. In Nozawa Onsen for example, they are filled with nozawana, the local pickle which is said to help the first inhabitants survive the region’s snowy winters! Written by Thea of Zen Travellers. One must try food in Japan is tsukemen, or dipping noodles. 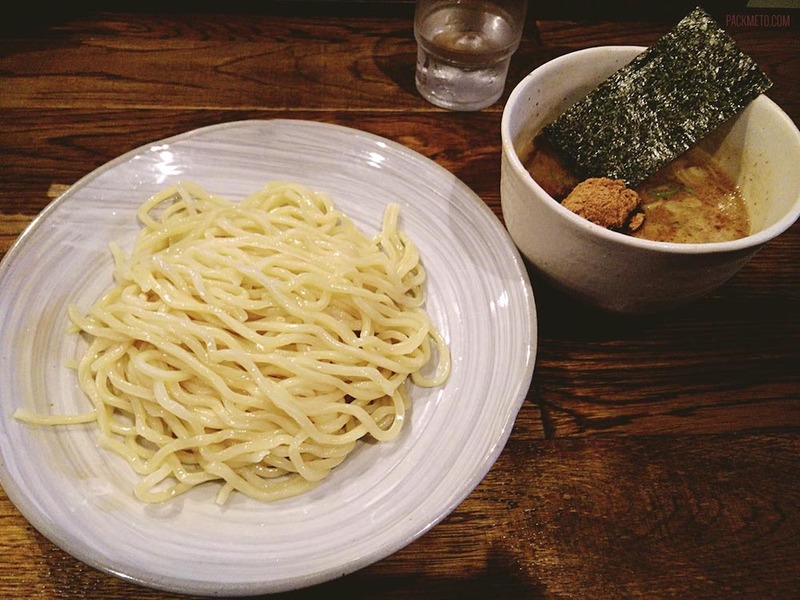 Unlike other ramen dishes, tsukemen is served with the noodles and the broth in separate bowls. To eat, you dip your often cold noodles into the hot, umami broth before slurping it up. It makes for a fun, interactive, and delicious meal. The broth tends to be a bit thicker than most to allow for it to easily cling to the noodles. Once you’ve finished your bowl of noodles, depending on the specific restaurant, but often you can ask for hot water to dilute the soup to drink as an end to your meal. One of my favourite places to get tsukemen is from Fuunji which is close to Shibuya station in Tokyo, but there are lots of places that offer up this unique take on a bowl of noodles. Written by Adelina Wong of Pack Me To. Teishoku is how the home-style meals are called in Japan. It’s almost always rice, miso soup, a vegetable pickle, a salad, and the main dish that is almost always a meat. This is the *real* Japanese food, the everyday food. It’s the food most people in Japan eat daily and it’s, more often than not, delicious! You can find it in teishoku-ya, such as Ootoya, or tonkatsu restaurants, but most restaurants (even the cafés) will have at least one option of it. Everyone who finds himself in Japan must try it at least once to get to know the culture, but it’s also extremely tasty and healthy! And better yet, it’s not expensive. In Ootoya, for instance, you can get a proper teishoku for less than US$ 10. Grab some chopsticks, a cup of tea, and enjoy the real Japanese food. 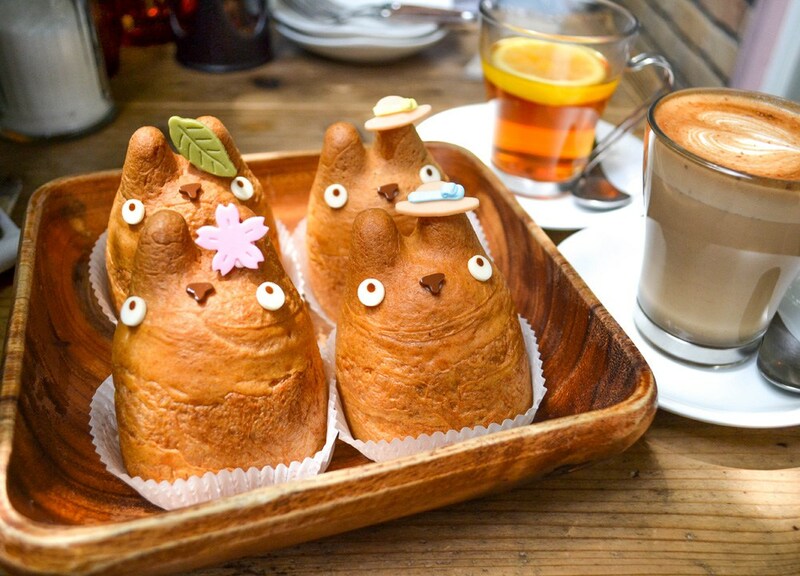 The Totoro Cafe, or Shiro-hige cream Puff Factory to give its official name, is found in the quiet suburban Setagaya neighbourhood on the outskirts of Tokyo. And here is where you will find Shirohige Totoro Cream Puffs, a Shu Cream dessert of puff pastry, filled a sweet, creamy custard filling. But most importantly it’s shaped as Totoro, a cute and cuddly cult-like cat/bear/God creature, famous from the Studio Ghibli film “My Neighbour Totoro”. And there are four different fillings, including custard, strawberry, caramel banana and chocolate. I recommend ordering all four. The café itself is cute as expected, sharing memorabilia from the Totoro movie, as well as other names from the Ghibli franchise. And adding to the intrigue of the Totoro Cafe is that the owner is said to be called Miyazaki, as in the man behind Studio Ghibli Hayao Miyazaki, although there is no real confirmation if he owns it. However we like to think he does. Are you looking for cool food tours in Tokyo? On Get Your Guide you can find lots of possible food tours, check out the options here. There are so many things to eat in Japan and Yakiniku, a meat lover’s dream, is a must! Also known as Japanese BBQ, Yakiniku is not only delicious but also a highly interactive dining experience. Most Yakiniku restaurants offer private dining rooms where you can grill your own meat. The raw ingredients are brought to your table and following a few basic instructions you are left alone. If you need any assistance, there is typically a call button that summons your waiter. If meat isn’t your protein of choice, you can opt for seafood and fresh vegetables. The perfect pairing to a Yakiniku meal is Shōchū or a local Japanese beer. There are tons of Yakiniku restaurants around Japan, but two of our favourites are Jojoen and Tendan. Tendan has a location in Tokyo and Jojoen can be found in various cities across Japan. Picture thinly sliced Wagyu strips, sirloin, beef filet and many other varieties of meat sizzling on a grill with tasty dipping sauces. I’m getting hungry just thinking about it! Written by Pamela Chieffalo of Travel Like a Chieff. Kobe Beef is the gold standard of beef world-wide. The meat is finely marbled and when you take a bite, the meat slowly and luxuriously melts in your mouth. It was fun to try this mouth-watering treat while in Japan but tasting it in Kobe itself was a particularly enjoyable experience. There are many restaurants in Kobe specialised in this delectable meat and they are easy to find. The dish is served with sides of vegetables or other accompaniments. Pair the meal with a glass of wine and you’ve got yourself a top-notch foodie experience. Tamagoyaki is often eaten as a side dish in Japanese meals. You can also find it on some sushi. It’s a bit like an omelette, but the cooking method is a little different. The Japanese word literally means “grilled egg”. The taste is sweet and eggy and it’s good with some soy sauce. There is a special rectangular pan for cooking tamagoyaki. It’s called a makiyakinabe and is only used to make this dish. 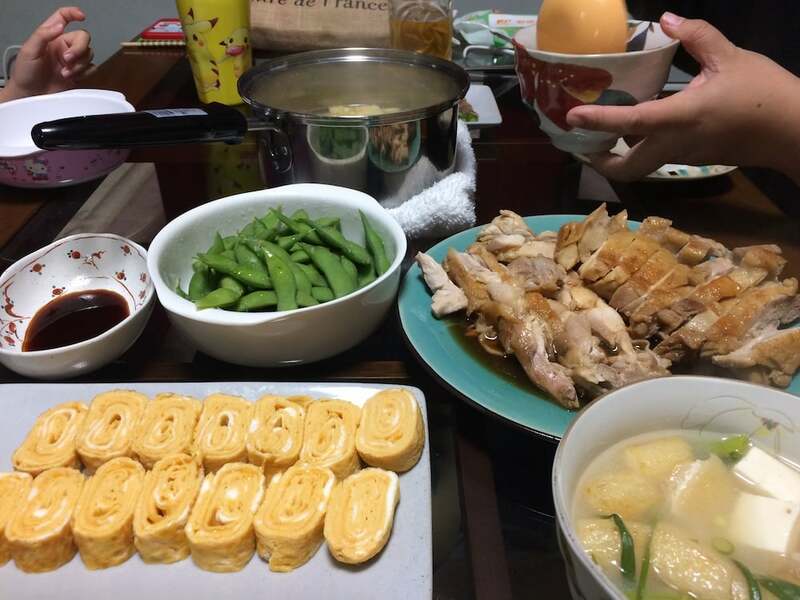 I attended a cooking class in Fukuoka, Japan and learnt how to make it. It’s a really simple dish that can be whipped up in 5 minutes. The only problem for me is I don’t have the right kind of pan back home! It is really yummy and I recommend you try it. My daughter really enjoyed it and I can imagine that even fussy eaters would like this. Written by Suewan Kemp of RTW Families. Yakitori is a Japanese word meaning ‘yaki’– to grill, and ‘tori’- bird. Chicken is skewered and grilled over a charcoal barbeque. They are fresh, tasty and a classic Japanese food to try. 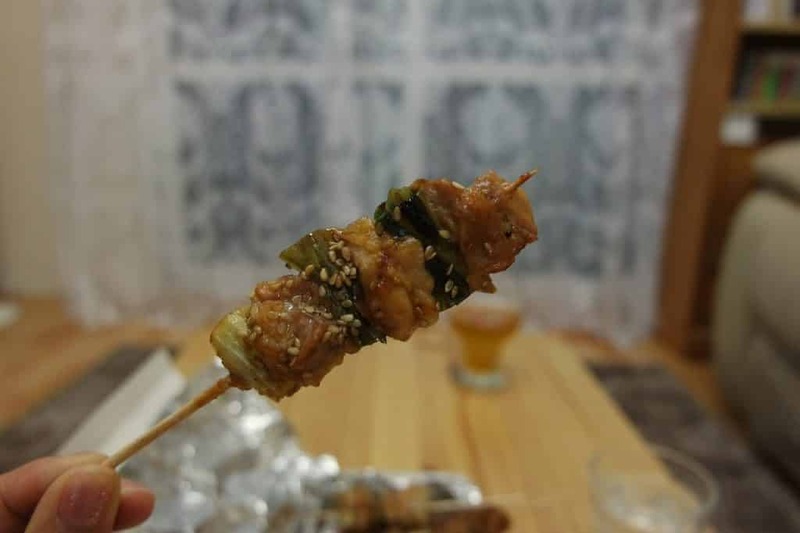 Yakitori is served in Izakaya (Japanese pubs) and dedicated Yakitori restaurants. They are perfect as a snack, but also make a convenient and cheap meal. The best place to sit is up at the bar where you can watch the chefs at work. We suggest you grab a beer or a sake and graze your way through the menu. Yakitori bars are great for families as the vibe is informal and the service is quick. They are also a great choice for vegetarians as they offer a range of skewered vegetables including mushrooms, asparagus, peppers, leeks and onion. When you have had your fill, tally up the skewers and pay by the stick. A word of warning – all parts of the chicken are on the menu, so you might want to check the translation before ordering! Written by Rachel Rodda of Adventure and Sunshine. Takoyaki is a street food originally from Osaka, but enjoyed all throughout Japan including Tokyo. 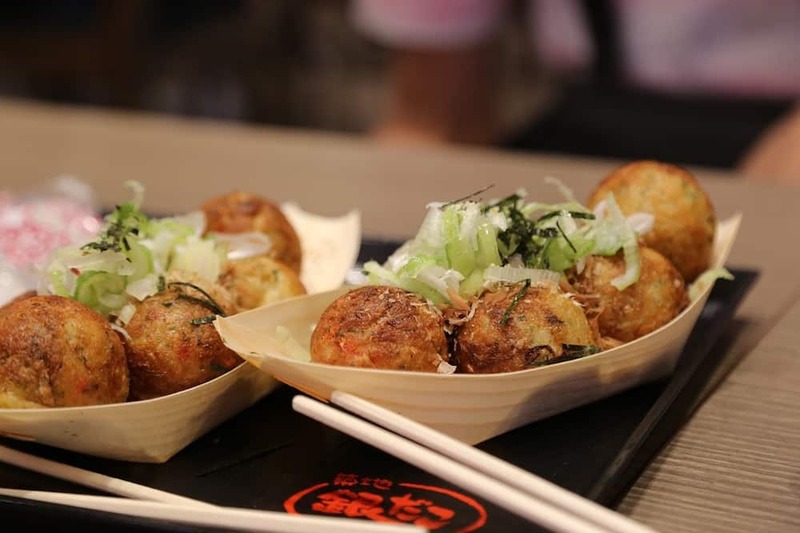 Takoyaki are basically octopus dumplings, balls of dough with chopped octopus that are cooked in a hot griddle. They are topped with lots of delicious Japanese toppings, such as kewpie mayonnaise, Japanese BBQ sauce, bonito (dried tuna) flakes, pickled ginger, and green onions. They are best enjoyed piping hot, eaten on the street with a pair of chopsticks, right after seeing them made in front of your very own eyes! Written by Allison of Eternal Arrival. In Japan there’s no real street food culture like in other countries around Asia, where you see people eating full meals on the street. Most of the times, you just see people nibbling on things like tempura or sweets. 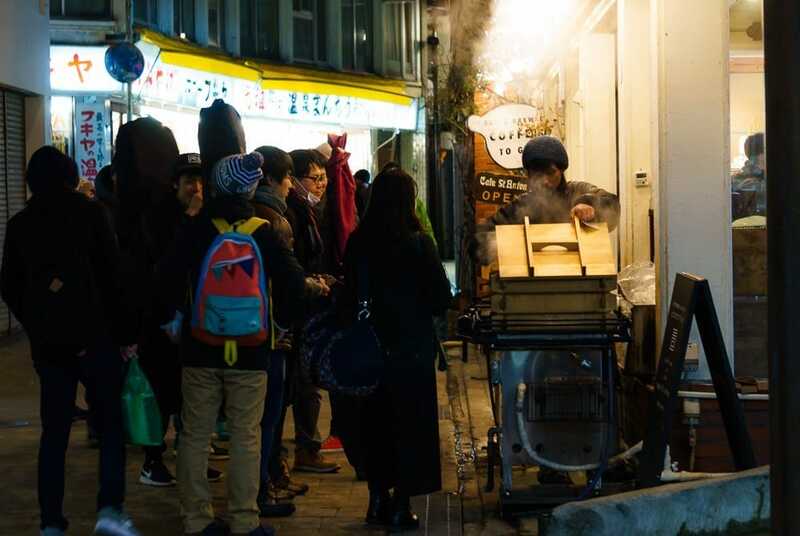 One street food specialty, which is also quite healthy, is oden. It’s a winter dish of vegetables, eggs, fishcakes and konjac simmered in a light soy and dashi broth. 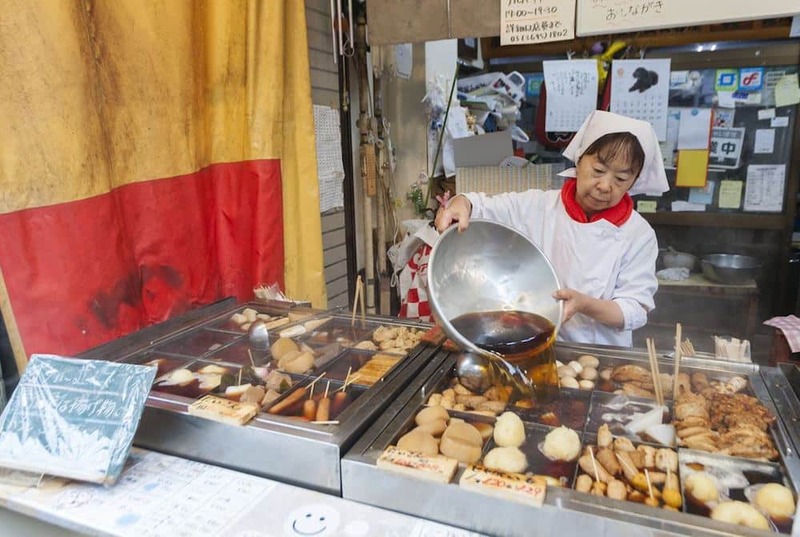 The first time I had oden was in Sunamachi, a pedestrian Tokyo street also known as ‘Side Dish Street’ because many locals head there to buy side dishes. This lady had a counter full of simmering pots with skewers stuck in it, which she was refilling constantly. I couldn’t help but try it and fell in love after the first bite! It’s definitely one of my favourite street snacks in Japan! Written by Margherita Ragg of The Crowded Planet. On a sunny day in Kyoto, a pink ice cream caught my eye. It was sakura ice cream and I just had to try it. Flavoured with the petals of cherry blossom, known in Japanese as sakura, this frozen dessert was a real treat. It may surprise you that even though the flowers come from the cherry tree, the ice cream has a floral aroma and taste. There is no cherry flavour. People flock to Japan in spring time to see the cherry trees in full bloom. This is the best time to try cherry blossom ice cream. The petals are infused into the creme anglaise base of the ice cream for a subtle flavour. Once the peak petal season has passed, preserved blossoms are used. If you like the taste of sakura you can try it in specially flavoured mochi filled with sweetened red bean paste or sakura-manju (steamed buns). Written by Katy Clarke of Untold Morsels. Kaiseki ryori is Japanese Haute Cuisine. You would traditionally eat this while staying in a Ryokan. The meal is one of many dishes and is usually regional specialities. Most of our dishes were just a single mouthful, but that one bite was delicious. Kaiseki Ryori is traditionally served in your room on low tables with stunning and immaculate presentation. In our Japanese haute cuisine, we were served 15 dishes – from sashimi to snail to miso soup. There were tempura and Japanese pickled vegetable. 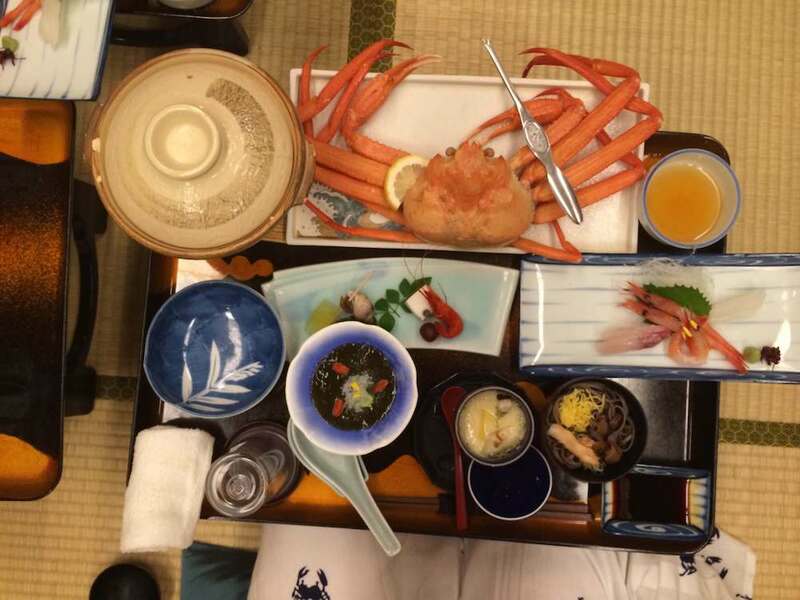 We cooked a Japanese hotpot on our low tables, we ate grilled fish and the speciality of the area, Crab. Kaiseki ryori is traditionally finished with rice, signalling the end of the meal. We washed all this down with traditional Japanese sake with our meal and then Japanese tea. This is a unique dish – or a set of dishes – to eat in Japan, what makes it very special is the environment in which you will eat your meal. It’s a truly Japanese tradition and one well worth experiencing in the best ryokan you can afford. 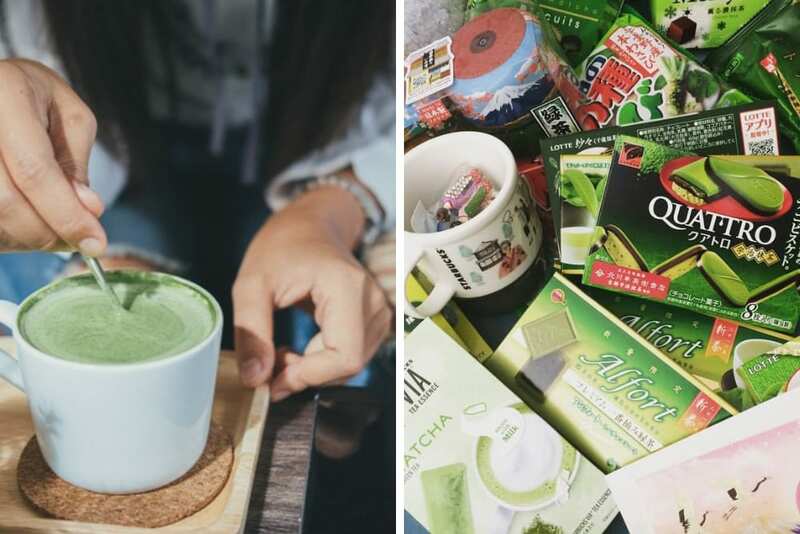 My love for Matcha (finely ground Japanese green tea leaves) goes way back: early 2000’s, long before it became an Instagram sensation. I started with matcha lattes, and cold matcha drinks, but I got to try the many matcha desserts on offer, and fell in love even more. Chocolates at Convenience stores: grab a white chocolate chip matcha cookie, mochi, juicy matcha baumkuchen, KitKat matchas, and every matcha-flavoured chocolate there is. Written by Marie Gizelle of Our City Travels. 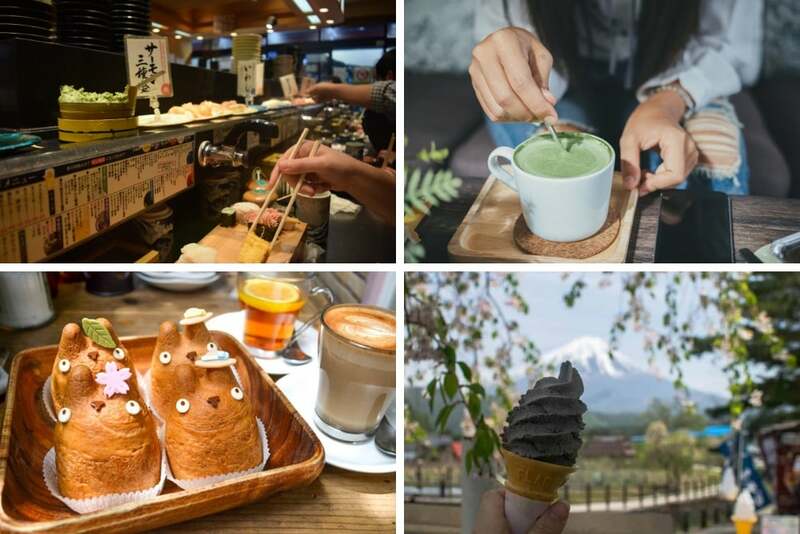 Japan is full of unique places to visit, sights to see and of course, foods to eat. During my travels throughout Japan, I had a list of things to try, one being Fugu, the poisonous puffer fish that requires much skill to prepare. Two to three years of training is needed for chefs to be able to prepare this deadly fish. Tetrodotoxin is found in the fish’s intestines, ovaries and liver, and a fatal dose of poison can be as small as the size of a pinhead – it is 1200 times deadlier than cyanide! Obviously, you want a trained chef to handle and prepare this meal and that can quickly hike up the price into hundreds of dollars for a small meal. Along the busy Osaka fish market, accredited chefs prepare this dangerous meal for a fraction of the price. While this almost transparent fish is quite tasteless, the story is well worth a bucket list item for me and anyone looking to try unique Japanese cuisine. 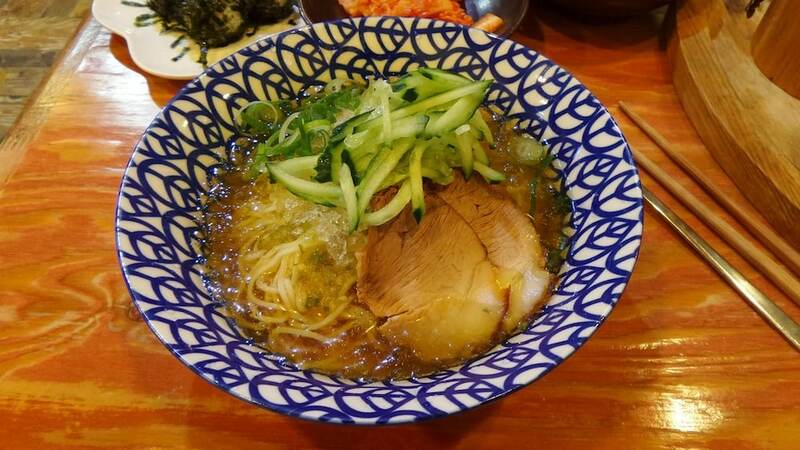 You’ve probably already had ramen even if you have never visited Japan, it’s an extremely popular dish that is available in most countries all around the world. Ramen is a noodle dish meant to be slurped up noisily and usually features a delicious, meat-based broth that has been cooked overnight or longer. If you visit Japan, you should eat ramen as much as you can. I am from Los Angeles and we probably have some of the most delicious ramens outside of Japan, many of the top chains from ramen have set up in our Little Tokyo area, but I still believe that the ramen in Japan is far superior. Also, another fun part of eating ramen in Japan is that vending machines are popularly used at ramen restaurants. The way it works is that you can order your ramen at the machine, usually near the entrance, and just bring your ticket up to the front. This provides super fast, delicious service! Written by Kaila Yu of Nom List. Japan has many signature dishes and is popular for its various types of noodles; and one of the most loved varieties is soba. In Japan, one of the most famous prefectures for Soba is Nagano where the highlands are perfect for growing buckwheat which is then ground and mixed with fresh mountain water. No culinary trip to Japan is complete without tasting the signature dish of Nagano. It’s socially accepted and expected to slurp your way through a delicious bowl of noodles in Japan. Thick as spaghetti noodles, chewy and fragrant, they are delicious both hot and cold. Soba noodles are traditionally made by hand, which you can experience yourself, and is regarded as higher quality than machine made noodles. Cold soba usually comes served with soy sauce and a bonito-based soup, whereas the hot version will come serve in a bowl of lightly flavoured broth with your choice of a variety of toppings including tempura, tofu, mushroom etc. Written by Marc of The One Hit Wander. Sushi is the most famous food from Japan, and you might have already tried it at home in your own country. However, I can assure you that Sushi doesn’t taste the same as in Japan, at least not in Europe or the U.S. The freshness of the fish and the fact that they prepare the sushi right away after your order makes up the great flavors and quality. And there are so many types of sushi you could choose from! Sushi is basically fish or seafood combined with rice. It’s not the equivalent to raw fish, and there are many kinds of way to serve sushi. I love the Salmon sushi and the maki rolls made with seaweed! 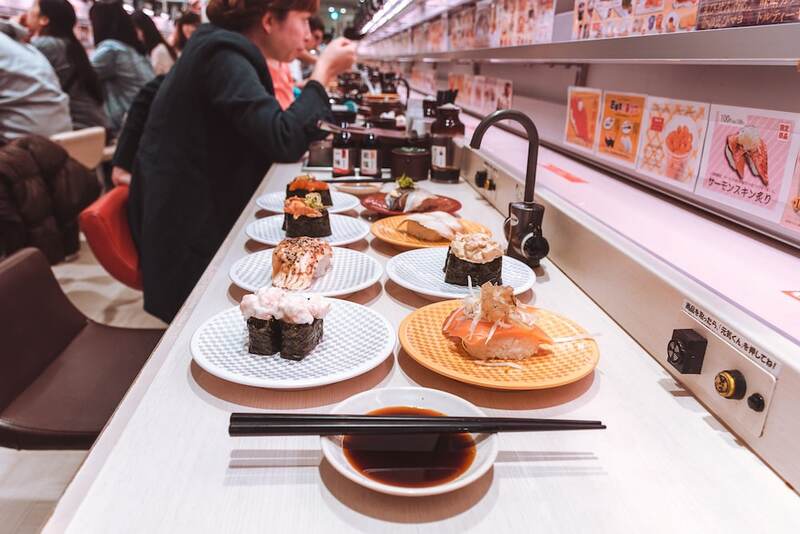 The best and cheapest restaurant to try real sushi in Japan is called Genki Sushi, and it’s a kind of fast food chain for sushi in Japan, with great quality. Written by Christine Wedberg from Christine Abroad. Sashimi is another very popular Japanese dish, served all over the world. 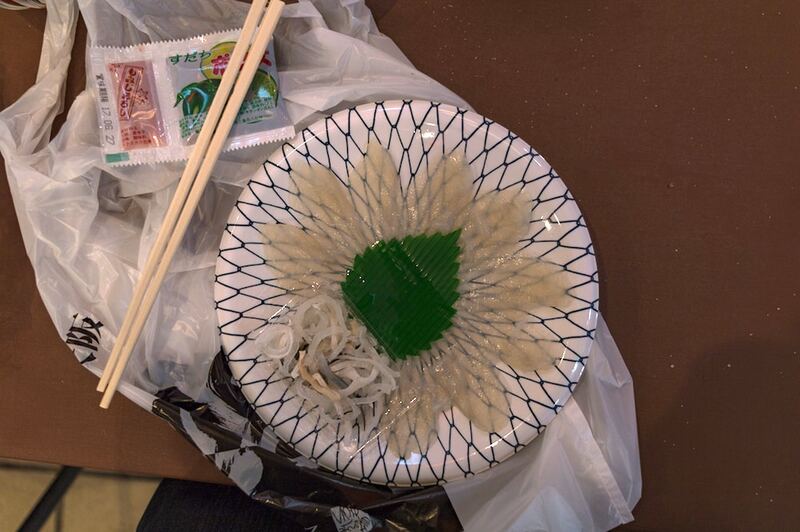 This traditional Japanese dish is raw fish cut into small pieces and served with soy sauce, wasabi and ginger. The best sashimi is when it’s extra fresh. In Japan you can try sashimi at a sushi restaurant or a traditional Japanese restaurant. Did you know there are all sorts of crazy flavours of KitKats? Matcha was already mentioned above, but there are loads of flavours of KitKats in Japan. 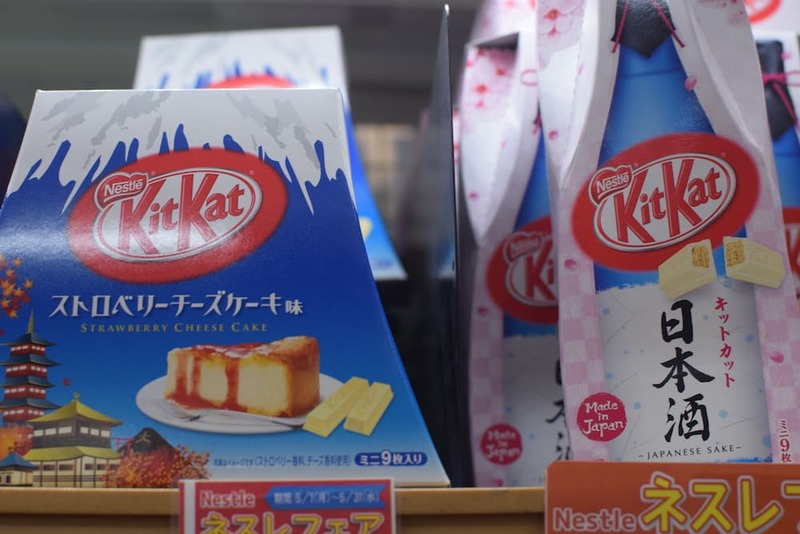 Strawberry cheesecake, Japanese Sake, Cherry Blossom… Even baked potato is a KitKat flavour! You need to try at least one of these. Written by Lisanne van Beurden. Read more posts on Japan here. Just like KitKats, there are a lot of crazy ice cream flavours in Japan. Lots of tasty flavours too, such as the sakura ice cream flavour mentioned above, or sesame ice cream, matcha ice cream and more. There are also some weird flavours, that are still worth trying: miso, seaweed, soy, wasabi and much more! 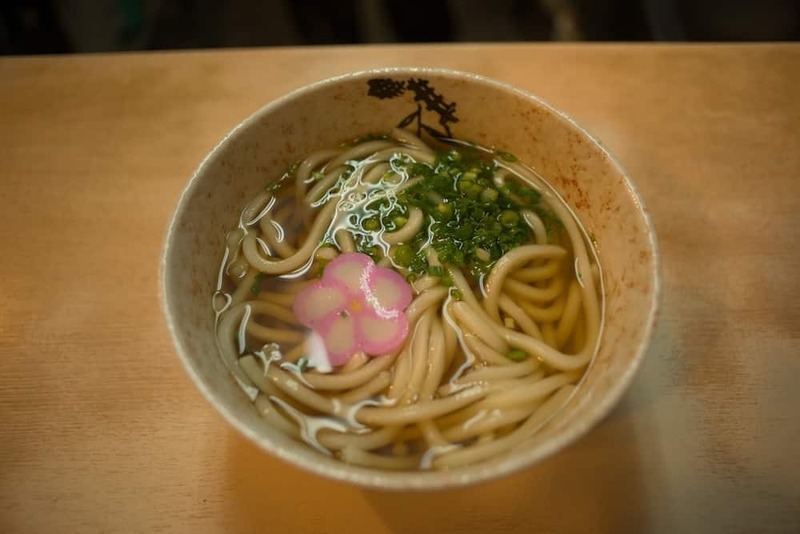 Udon is a simple, wheat flour noodle that is often served as a noodle soup. It comes with a broth called ‘kakejiru’, made with dashi, soy sauce and mirin. Udon can be topped with tempura or ‘aburaage’, which is deep-fried tofu. Written by Lisanne van Beurden of this blog! Read more posts on Japan here. My favorite Japanese food is okonomiyaki. It’s available around Japan but originally comes from the Kansai (Osaka, Kyoto, Kobe) area. Hiroshima even has its own version. It’s often described as a savoury cabbage pancake, but is so much more! All the ingredients are mixed together in Osaka-style and they are layered (with more cabbage) in Hiroshima-style. There are many variations possible, for instances with pork belly, one with a layer of fried noodles (modanyaki) and the slightly thinner negiyaki with spring onions. They are covered in mayonnaise and a special thick, delicious okonomiyaki sauce. You can add extras, such as pickled ginger, seaweed flakes and fish flakes for more flavor. 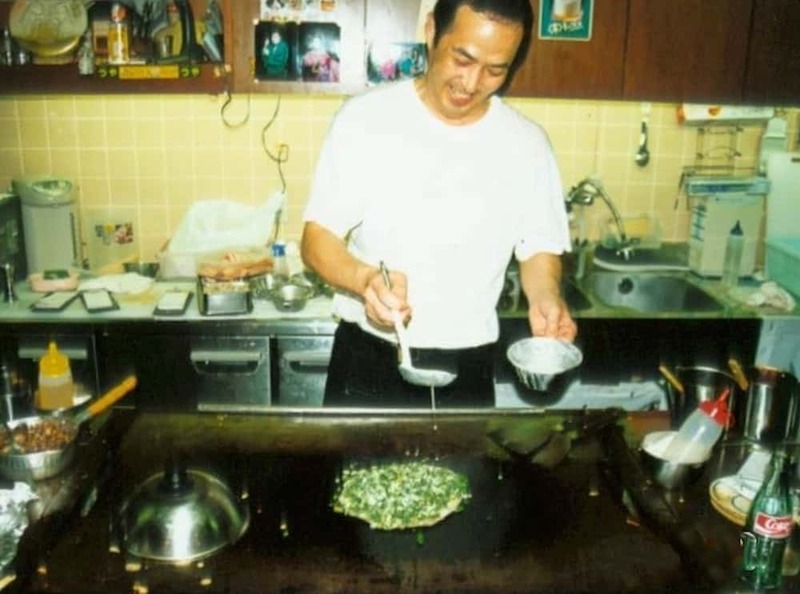 Okonomiyaki is typically served in small restaurants where you sit at a counter that has a hot plate running along it. Sometimes you cook the ‘pancakes’ yourself from the bowl of mixed ingredients given to you, and sometimes you watch the chef making it in front of you. This is true Japanese comfort food. Written by James from Travel Collecting. 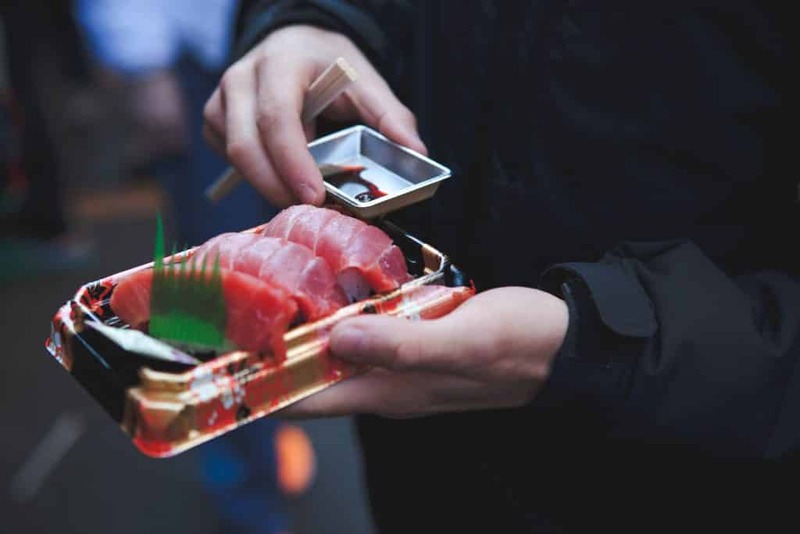 If you’re considering a food tour in Osaka, check out these possible food tours in Osaka by Get Your Guide. 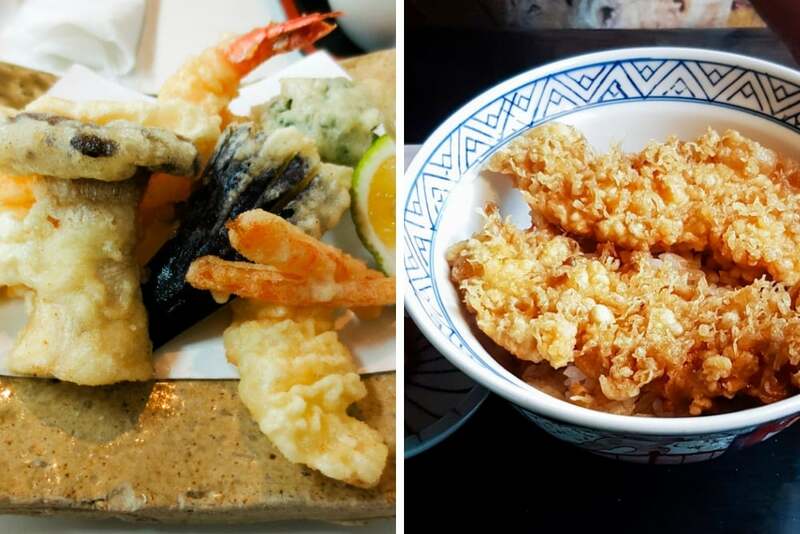 Tempura is one of the few Japanese dishes that’s become very well known outside of Japan and many of us have come to love it long before we visit. Made by dipping ingredients such as fresh vegetables, mushrooms and seafood into a light batter and deep frying them, it can be more of an art than you might think. The best tempura chefs spend many years learning how to make tempura — mixing the perfect batter, dipping the items so that just the right amount of batter adheres, getting the temperature of the oil just right, and cooking and agitating it in the oil until it’s ready. Light, crisp, not at all greasy and the ingredient inside cooked to perfection. 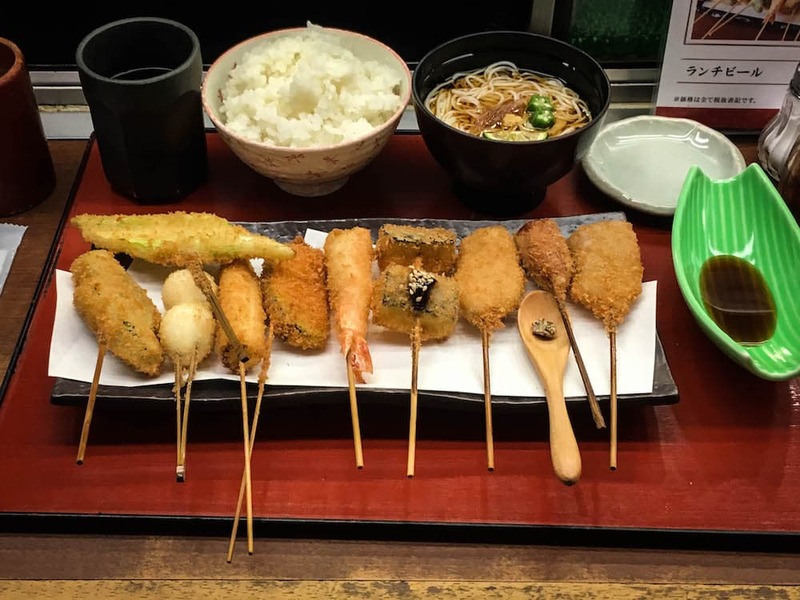 I strongly recommend seeking out a tempura specialist restaurant during your visit, such as Tempura Tsunahachi Honten located in Tokyo’s Shinjuku district. Here, you can ask for a seat at the counter to watch the chefs at work, and order a set menu or individual dishes to appreciate the art of tempura at its finest. Written by Kavita Favelle of Kavey Eats. Being a vegetarian in Japan can be a challenge but with a bit of research there are plenty of meat and fish free Japanese dishes you can try. One of the easiest to find snacks is rice balls. The most common form is onigiri—steamed rice formed into triangles or balls and usually stuffed with fillings (pickled plum is best for vegetarians) and wrapped in nori (dried seaweed). You can find these in every convenience store. Even tastier are rice balls on sticks that are sold from street stalls in certain towns. In Nikko and Takayama we enjoyed dango—small dumplings made from rice flour and brushed with miso or soy sauce. In the small village of Tsumago in the Kiso Valley we tried the local specialty gohei mochi—grilled rice dumplings served on a stick topped with a sesame and walnut sauce. Delicious! You’ll find different variations of rice balls and dumplings all over Japan so look out for local specialities. Written by Erin McNeaney of Never Ending Voyage. 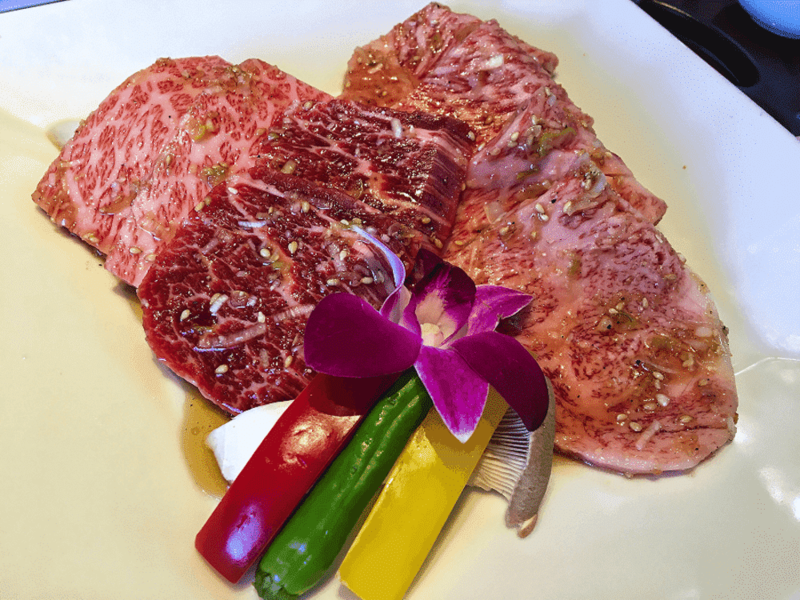 Yakiniku is a grilled beef. It’s marinated in a sauce and grilled lightly over the fire. 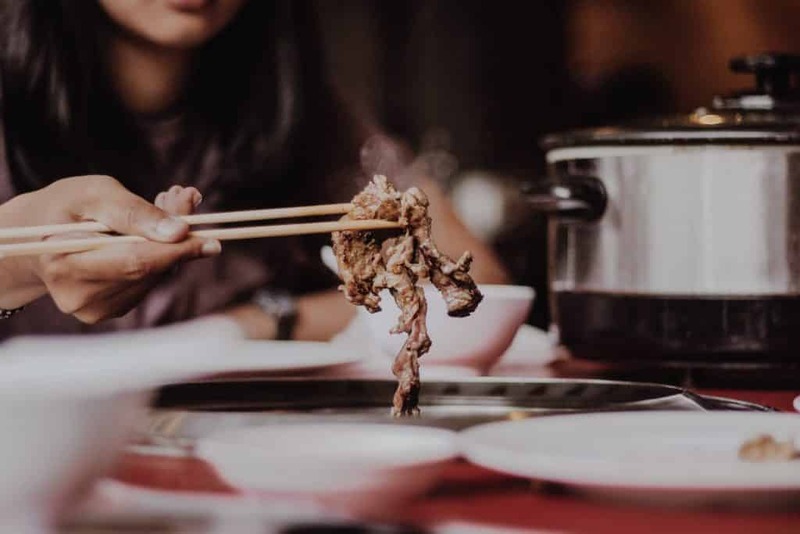 Yakiniku can be made with all sorts of meats, but the most popular ones are kalbi and sirloin beef. There are special yanikiku restaurants to try this dish and the quality of meat really differs per place, so be sure to choose wisely! What is your favourite Japanese dish? And have you tried every dish mentioned? Let us know in the comments below! Wow. Reading this post has made me salivate so badly. I really miss Japan and also agree with you Okinomiyaki is my favourite dish also. On the contrary, this post has brought to light a lot of Japanese dishes I didn’t know or get to try. I have to visit soon and try as they all look amazingly tasty. I like to eat Japanese Food very much, Thank you so much for this informative post! Food has been a strong focus of our three trips to Japan so far, and this post is reminding me of all the fabulous things we’ve eaten. Great resource! Japan is at the top of my bucket list! I’ve always wanted to go! And when I do, I will try all of this food!! Yes! And there are so many wonderful regional treats. 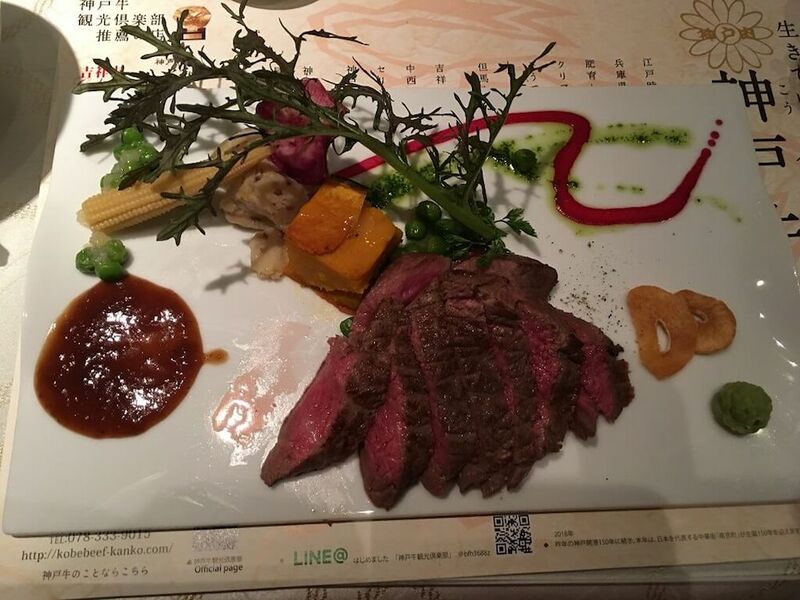 The city I lived in, Sendai, is famous for grilled beef tongue. It sounds gross to some people but it’s actually delicious. 🙂 You make me miss Japan with all these wonderful food!